There is nothing more extraordinary in a woman's life than having her first baby. Pregnancy, birth, and being a first-time mom really gives the greatest joy! And this excitement for the coming of one's first child is often coupled with the eagerness for information. Infanticipation leads to several body changes and so an expectant mom should learn to take care of herself and her growing baby from the moment she finds out about the pregnancy to the day she gives birth. Ms. Clara Ramos (Brand Manager, Kimberly-Clark Philippines), Dra. Belen Velasco (Vice-President, Perinatal Association of the Philippines), Dra. Maria Theresa Hilario-Jimenez (President, Perinatal Association of the Philippines), Mr. Ashwini Nagpal (Managing Director, Kimberly-Clark Philippines), Dr. Diosdado Mariano (Member, Perinatal Association of the Philippines), and Ms. Irish Tan Chua (Marketing Manager, Kimberly Clark-Philippines), during the official launch of Expert Panel in the Philippines. 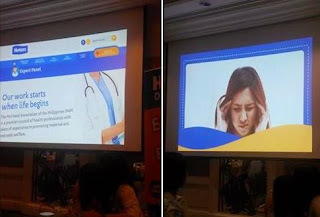 Hence Huggies® Philippines' parent company, Kimberly-Clark Philippines, partnered with the Perinatal Association of the Philippines (PAP) to create an online hub for moms to get direct access to helpful tips and advice on maternal and baby care. Huggies® Philippines launched its “Expert Panel” today in a media event at the EDSA Shangri-la Hotel. This is a new online consultation tool to help guide new and experienced moms throughout their motherhood journey. According to a recent survey conducted by Kimberly-Clark Philippines, online information is one of the top sources moms use when getting tips about baby care and motherhood. Huggies Philippines recognizes this and created the Expert Panel. The Expert Panel provides moms a new opportunity to learn more about motherhood and how to better raise babies. As a result, moms and babies can feel assured that they are guided every step of the way. With this online consultation platform, moms can easily access credible tips and advice straight from the Perinatal Association of the Philippines (PAP) experts via the official Huggies Philippines website at www.huggies.com.ph/ExpertPanel. The Huggies Expert Panel is ever ready to help answer questions on conception, pregnancy, child birth, baby care, parenting, baby sleep routine or toddler woes. Mothers get expert advice straight from the trusted doctors of the PAP. Expert Panel will also compile all the information shared between active online moms and doctors, store it in the Huggies website, and make it available for free to anyone who wants to access it at any time of the day. This allows fellows moms to learn about key topics that others moms are asking about through keyword search or by clicking on a topic or tag.